This is the coolest present - a hand-finished, thick, quality solid sterling silver guitar pick, completely functional, on a thick leather or heavy sterling chain (you choose!). Offered in all of our fonts, and all of our finishes (shiny, brushed, and hammered/antiqued). It is completely functional, and was developed with a musician friend of mine for optimal play quality - great for slides. These thicker picks can be stamped on both sides. The number of characters available will be dependent on the font chosen. Dimensions are approximately 27mm x 32mm x 1.2mm. Shown here in the hammered/antiqued style, which provides a unique grip for slippery fingers, as well. Choose Chocolate or Black leather, and length: 18, 20, 22 or 24". Second necklace she has done for me! Outstanding!!! Wow! Excellent work! 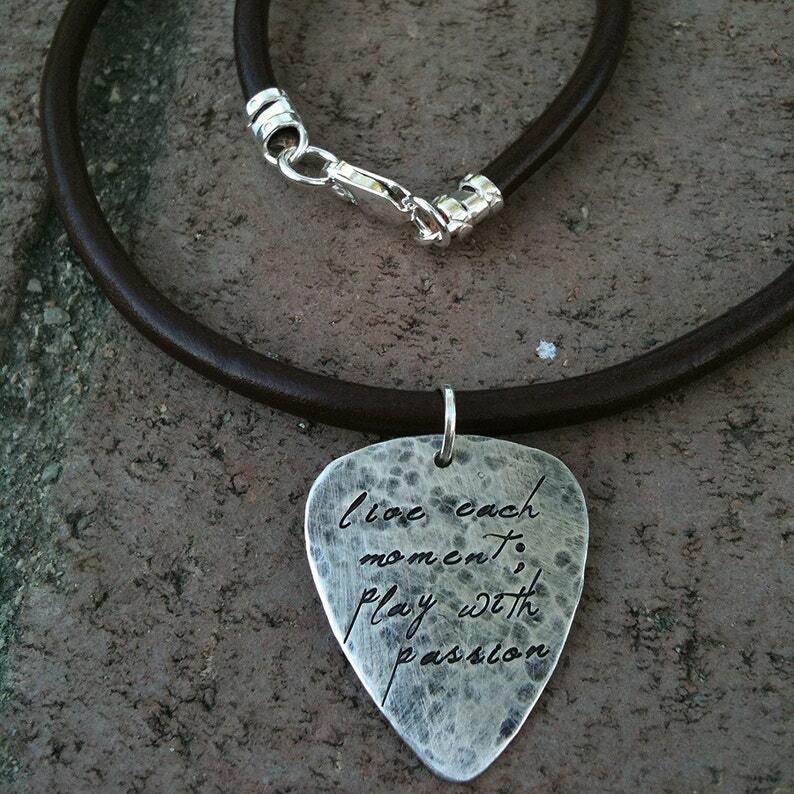 Guitar pick necklace will be a hit on Father's Day! !